After emerging as one of baseball's most recognizable players, during his nine seasons with the New York Yankees, the six-time All-Star has moved somewhat under the radar, since arriving in Seattle for the 2014 season. Don't feel too bad for Cano though, considering that he joined the Mariners after inking a much publicized 10-year/$240 million deal. Cano's transition from left-handed hitter friendly Yankee Stadium, to the far more cavernous dimensions of Safeco Field, has most certainly impacted his power numbers. Amid averaging 23 homeruns per season in The Bronx, the now 32-year-old hit just 14 jacks in 2014, while totaling only 11 thus far in 2015. 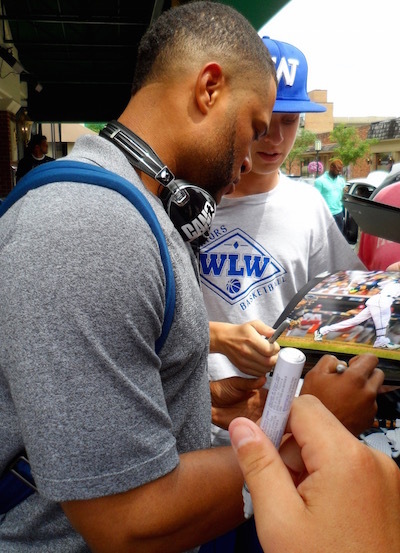 Above is an iFolloSports.com original photo of Cano signing autographs, during a recent visit to Detroit. The picture was captured by Michigan corresponded Lance Martinez.